For most of my life, I’ve had the idea drilled into my head that sharks should be feared. That they should be hated. That their sole intentions were to harm people. My dad, who swam for a semi-professional swim team for more than half of his life, was the first person who taught me to love and respect our oceans and all of their inhabitants. My mother was the second, as she supported my dad in his passions and decided it was only right for me to follow in his footsteps. As a child, I loved to read; so together, my parents invested in a miniature home library, with much of the books being centered on marine life. One of my earliest childhood memories consists of me sitting cross-legged on the floor of my playroom with my mom showing me pictures from a picture book on marine animals. She pointed to a picture of a gray, finned creature with sharp teeth and small eyes. Fish, I thought to myself. They use their sharp teeth to hunt for fish. As time went on and I grew older, I began to see these sharks depicted in cartoons as dangerous – beings that should be feared. I saw several movies where they actively pursued and brutally attacked humans, and I realized that the media depicted them as enemies of people – that they used their sharp teeth to hunt for us, not fish. I admit that for a long time, I fell victim to this fallacy. I even went so far so as to avoid swimming at the beach because I feared that I would be attacked by sharks. With each year came a new movie about shark attacks, and with each year my fear and underlying hatred for them grew. I thought to myself, how could these creatures be so heartless so as to attack innocent people? But all of that changed when I learned the truth. Sometime during my high school years, while I was developing my passion for marine conservation, I learned that sharks kill approximately less than ten people per year. This statistic was incredibly shocking to me, as it went against what the media depicted for most of my life. Not only did they kill such a small amount of people – they also killed people by accident, and out of curiosity: not intentionally, as most people would think. According to NOAA, sharks only ever attack humans when they are confused or curious, especially when a human is splashing about or making a scene. When they attempt to investigate, they may accidentally attack – but they don’t do so intentionally. 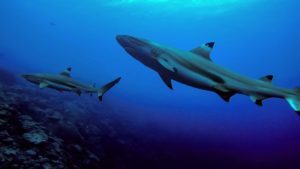 People also tend to forget that when they are in the water, they have actually entered the sharks’ domain – thus, they have entered at their own risks. Sharks have been around millions of years before humans came about. It doesn’t make sense to argue that humans are part of their normal diets, because how could they have made it all those millions of years without us? Their diets consist of smaller fish and invertebrates, and while some larger shark species prey on seals or sea lions, humans are never a part of their everyday diets. As I read on, I delved deeper, heading into the importance of sharks in our ecosystems along with the impacts that we have on their lives as well. I learned that humans kill over 11,000 sharks per hour on the regular as part of a practice called shark finning, where we kill sharks and cut off their fins to make shark fin soup. Sharks are also killed intentionally for their meat and skin for food and leather, respectively. I couldn’t believe what I was reading. I couldn’t believe how misunderstood these creatures were. I couldn’t believe how much anger I’ve harbored towards the wrong beings. It wasn’t the sharks that I should be angry at. It was the people who didn’t see how important they were that I had to be. Thus began my lifetime dedication to the encouragement of and education on shark conservation. I began going to spots in Guam’s waters that I heard were frequented by sharks so that I could see these beauties up close for myself and give them the respect and admiration that they so deserved. I started voicing out my disapproval at how people so misunderstood sharks based on what they saw in the media. I began educating myself on the importance of sharks in our ecosystems and how they proved as purely beneficial to our earth’s wellbeing. My love for sharks grew, and I desired to share this love with others – especially those who were stuck in the foolish mindset that sharks should be hated and never respected. My dreams were finally reached. A little over a month ago, I swam a few feet away from three blacktip reef sharks for the first time. I knew that they would be in the area, and I swam out to them with my friend anyway, because we both knew that these beauties were truthfully more afraid of us than we were of them. The experience was one to remember: I dipped my head in the water and saw the three of them moving about just a little way ahead of me, and my body went completely still. Not out of fear, but out of awe. They saw me; I know they did. But they chose to swim the other way. They didn’t even swim up to me out of curiosity; they were too shy to. I wanted to chase after them, swim with them, admire how beautiful they were up close – but I knew that it was best not to, and I stayed back out of respect for them. My friend and I spent the rest of that evening swim in admiration of what we just did. Being able to share the waters with those blacktips for the first time was truly a humbling experience, one that I’ll never forget. Upon entering MCC, I developed rich friendships with my fellow student Marine Team members, who, thankfully, share the same passion for shark conservation that I do. 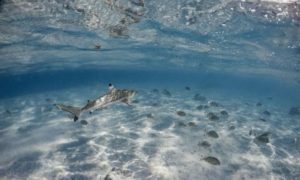 Most of the Marine Team who got to fly out to Yap last month for Manta Mania were graced in the waters by the presence of around 30 blacktip reef sharks, and footage of their experiences only show them wandering about the sharks in awe and admiration – how it should always be. 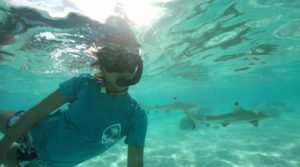 Lani, who swam with sharks daily during her stay in Moorea, attempted to reach out to the sharks to say hello, only to have them swim away out of shyness. Ashley said they were “like puppies,” and swimming with them made her love the ocean even more. And Tash expressed the vital fact: “The ocean is their home, not yours; so you have to respect that.” We all harbor an infinite love for sharks that we only hope can spread to the hearts of others as well. So the next time you see a shark depicted as nothing but a danger to humans in the media, remember that that depiction is wrong, in every sense of the word. Their intentions are never to harm you, let alone kill you – they’re just curious, like we are. And if you ever get the chance to swim with one – do like Rob Stewart and we do: take in its beauty as an amazing being of the sea. It is perfect. Once you learn this, your whole world will change. 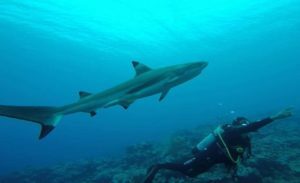 It is wonderful that you have the opportunity to not only swim with sharks, but pursue a career researching and advocating for these amazing creatures! 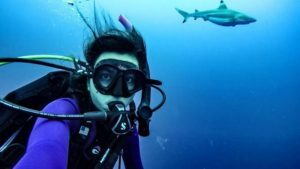 The vast majority of people have only heard of sharks as deliberate predatory animals, oftentimes appearing out of nowhere, only to viciously kill or maim their unsuspecting victims. This is what is depicted in movies and books, and most people never getting a first-hand chance to learn or observe otherwise. Every year, there is increasing awareness to the growing number of conservation groups and people concerned for the health of our marine ecosystems, including marine fauna and flora that we all know so little about. The instant click of an internet video or story brings even more interest and awe for these animals, which rarely come in contact with humans. It is my hope that with time and dedication by people like you, that sharks and other marine life are observed and researched more, so that we can use that knowledge to help secure their survival for our children to appreciate long after we are scattered ashes in the ocean floor.